Find the right Season for You! 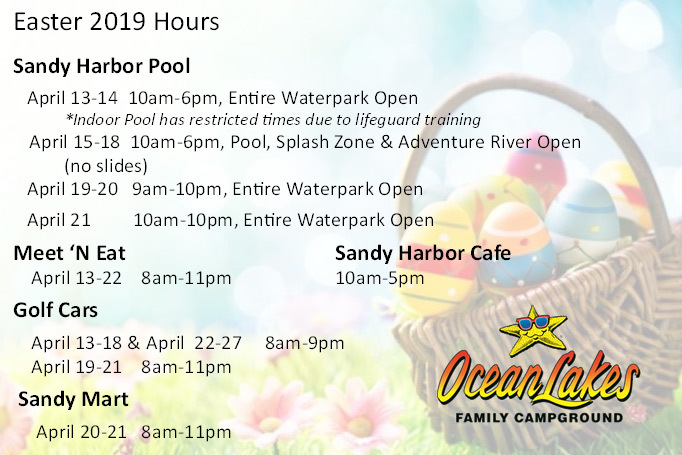 Spring and Summer are just around the corner and many guests want to know about our pools, and especially Sandy Harbor Water Park. See hours here. 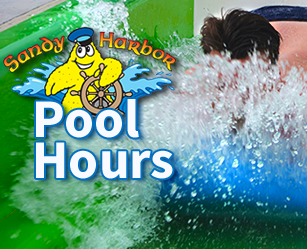 Hours for April 12 – 22, 2019 | Enjoy a special week as families celebrate together! 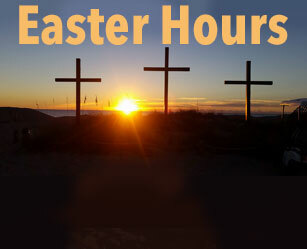 Sunrise Service is at 6:30 AM. See all Activities Here. Ocean Lakes Family Campground was built by Mary Emily and Nelson Jackson, along with their five daughters, starting in 1970. On July 2, 1971, Ocean Lakes opened with 30 campsites and one bathhouse. Nelson Jackson was 50 years old at the time. “People were lined up outside the gate by the hundreds and we were clearing spots for their campers as fast as they could park ‘em,” he explains with a smile. Ocean Lakes located at the south end of Myrtle Beach, ranks in the top 1% of campgrounds in the United States providing outstanding customer service and amenities. It is operated by an award-winning team who strives to provide the best family-friendly resort destination, year round. Today, Ocean Lakes features 859 campsites and 2,567 annual lease sites on 310 oceanfront acres with nearly one mile of beachfront, five bathhouses, and more than 500 employees in the height of the camping season. It is the largest campground on the east coast and one of the largest in the United States. Find the season that is right for you! The energy level of our RV park changes with the seasons. On an average seasonal day (when the kids are out of school) Ocean Lakes has 25,000 – 35,000 guests enjoying the countless amenities that have made it a local favorite and a national vacation destination. When the kids are back in school our campground feels more mellow and relaxed. Through out the year, we sprinkle in a few special events that turns the energy level up a notch or two and are sure to provide a great weekend getaway for you and your family. “We could do a lot of things with 310 oceanfront acres in Myrtle Beach, and we’ve had many lucrative offers, but we believe that everyone – the butcher, the baker and the candlestick maker – should have the privilege of enjoying God’s beautiful ocean,” explains Nelson Jackson, during an interview when he was 88.